In the execution on a smart card, side channel attacks such as simple power analysis (SPA) and the differential power analysis (DPA) have become serious threat . Side channel attacks monitor power consumption and even exploit the leakage information related to power consumption to reveal bits of a secret key d although d is hidden inside a smart card. 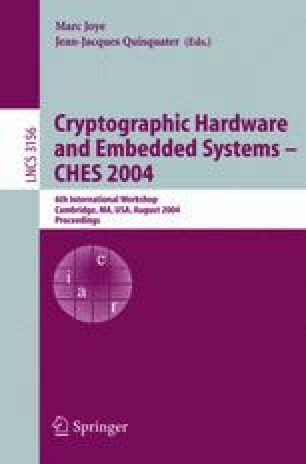 Almost public key cryptosystems including RSA, DLP-based cryptosystems, and elliptic curve cryptosystems execute an exponentiation algorithm with a secret-key exponent, and they thus suffer from both SPA and DPA. Recently, in the case of elliptic curve cryptosystems, DPA is improved to the Refined Power Analysis (RPA), which exploits a special point with a zero value and reveals a secret key . RPA is further generalized to Zero-value Point Attack (ZPA) . Both RPA and ZPA utilizes a special feature of elliptic curves that happens to have a special point or a register used in addition and doubling formulae with a zero value and that the power consumption of 0 is distinguishable from that of an non-zero element. To make the matters worse, some previous efficient countermeasures are neither resistant against RPA nor ZPA. Although a countermeasure to RPA is proposed, this is not universal countermeasure, gives each different method to each type of elliptic curves, and is still vulnerable against ZPA . The possible countermeasures are ES  and the improved version . This paper focuses on countermeasures against RPA, ZPA, DPA and SPA. We show a novel countermeasure resistant against RPA, ZPA, SPA and DPA without any pre-computed table. We also generalize the countermeasure to present more efficient algorithm with a pre-computed table. This work is partially supported by National Institute of Information and Communications Technology (NICT).